Title text: You know how einstein figured out that the speed of light was constant, and everything else had to change for consistency? My theory is like his, except not smart or good. Several of us at work have been trying to promote this standard as Elastic Standard Time for a while. We see it as an improvement over the current scheme of HQ Garbage Time which is when you record all timestamps as the local time of your headquarters without any timezone information attached. Cueball's system get really messed up above the arctic circle. Adjusting the seconds to meet his conditions would make them last longer than a day. I get his point, but tine systems can be beautiul. I'll just leave is here. Someone, somewhere, is already using that system and exporting seconds of variable length for use in the movie industry. Heimhenge wrote: Cueball's system get really messed up above the arctic circle. Adjusting the seconds to meet his conditions would make them last longer than a day. In my little Perl script I've been writing for working out actual local times across the world, I'm having to rethink the functions seeking "yesterday sunset" and "tomorrow sunrise" (for $now<$today_sunrise and $today_$sunset<$now, respectively) because of this little detail. Still, it's workable. PS: 43200 seconds per hemiday spread across the hypothetical maximum of 6 months is still 236ish adjusted-seconds per calendar day. PPS: Maybe the way to deal with it in periods of non-setting/rising sun is to just have (near-as-damnit) double-length seconds (sun-minima to sun-minima) during the current dominant phase and zero-length seconds during the absent phase, skipping straight into the next doubling(-or-lessening-from-double)-period. PPPS: ¹ Actually, it does work, I confused myself there. But I'd still need to establish a reasonable (i.e. "with a good reason") boundary for noon/midnight second-lengths, because there's still many solutions to a curve with 1s/s crossover rates at each 'fixed' point. Last edited by Soupspoon on Mon Sep 24, 2018 5:21 pm UTC, edited 3 times in total. Oh, and BTW, 6/6 is not "4/4 with triplets" . At best, 6/6 would be 2/4 with triplets. But I don't know how to draw a "1/6 note" . Given that the flags are binary (one for 1/8, two for 1/16, etc. ), I would need to tie together one eighth note, one 32nd note, one 128th note, ... on to infinity, to denote a 1/6 note. (i.e. converting 1/6 decimal into binary). I read 6/6 time as 6 beats to the bar and a whole note is 6 beats long. I would just use "regular" 'quarter' notes. I think sunrise to sunset at the north pole is technically 6 months, or 365.25 half-days. So that's how much you'd have to stretch time, making each second last 365.25 standard seconds, or about six standard minutes. The clock would basically become a year clock. sonar1313 wrote: I'm gonna use this time system to set a new marathon speed record. Some time during the summer. In Nome. How does one describe the sudden change of velocity at sunrise/set? Cooking instructions also cannot use this time system for repeatable results. But why bother with such complicated concepts as AM or PM? The 6/6 standard is not simple enough. i offer you a much better 6/6 standard. in my standard there is no AM/PM, just the value. And the sun still rises at 6 and sets at 6. You always know the time, it's 6. Clocks are always accurate and are easy to make. But you don't really need them because you always know the time. It is not possible to design a more simple and more beautiful standard. I stand by what I (for it was I) said. A quarter-note triplet is one sixth of a whole note. You get three of them in the time of two quarter notes, ergo six in the time of a whole note. (Or as I would say normally, a crochet triplet is a sixth of a semibreve). So 6/6 has measures (bars) the same duration as 4/4, but with the feel of 6/8. ETA: I just tried realised how it's strange that you Leftpondians call them "quarter notes" but you call the fraction "one fourth". Last edited by orthogon on Mon Sep 24, 2018 6:51 pm UTC, edited 1 time in total. jkclevel wrote: Several of us at work have been trying to promote this standard as Elastic Standard Time for a while. We see it as an improvement over the current scheme of HQ Garbage Time which is when you record all timestamps as the local time of your headquarters without any timezone information attached. We employ HQ+2 Garbage Time at my company, as we don't record timezone information either, but the timestamps aren't in the same timezone as our headquarters to begin with. Yerushalmi wrote: This is how modern Jewish religious time works as well. It was critical to medieval monks (and for all I know, modern ones as well). Prayers are required at roman hours, which made clock inventions both critical (the monk's souls depended on time keeping) and difficult (because the length of time kept changing). Granted, most of this is thanks to Saint Augustine, who lived in northern Africa. I'm not sure how much the day changed for him. balthasar_s wrote: But why bother with such complicated concepts as AM or PM? It is Now. Now O'clock. Fully embrace living in the moment. Live in the Now Time. Yeah, that's why I leapt straight for use DateTime::Event::Sunrise; straight after topping this thread, shortly after I decided I wasn't going to try to rewrite/readapt some form or other of the graphical whole-Earth day/night shadow-map for my purposes. As that video said at the end, use someone else's code! But only because this was supposed to be fun-and-lazy without any trigonometry to try not to mess up, nor needing to look up information on long-term planetary precessions, which was beyond the half-hour hack-job criteria I set myself. Local mountains and Eclipses and even clouds could really mess with the time system, depending on how sensitive you make it to the comings and goings of sunlight. We should just fix reality to be more convenient for timekeeping. Make days/months/years the same ratio (24 days a month, 24 months a year? years about 1.5x longer than they are now so days stay the same) and each always the same length. Divide days, hours, and minutes by that same ratio too, so a second is 1/24^3 days. Pfhorrest wrote: We should just fix reality to be more convenient for timekeeping. Make days/months/years the same ratio (24 days a month, 24 months a year? years about 1.5x longer than they are now so days stay the same) and each always the same length. Divide days, hours, and minutes by that same ratio too, so a second is 1/24^3 days. "No Soldier shall, in time of peace be one-fourthed in any house, without the consent of the Owner, nor in time of war, but in a manner to be prescribed by law." Ah, that's interesting. Maybe I don't notice "quarter" when I hear it. Like, even though I was specifically aware of the "quarter note" thing as a UK/US difference, I only just noticed that it isn't "fourth note". Yeah, we could just give all of space a slight curvature and make tau exactly six! There was a clock on the Berkeley campus at one point (until somebody stole it and graffitied "Time is running out!" on its plinth) that ran by getting an electric pulse once a minute from a master clock in another location. I'd have kept the clock and replaced its controller with a Geiger counter triggered by cosmic rays, but shielded to send one pulse a minute... ON AVERAGE. Sometimes eight in a second, sometimes half an hour between. The Mediterranean coast of Africa is at a similar latitude to the Gulf Coast of the US (~30°N). That means there’s about a 4 hour difference between the longest and shortest days of the year. 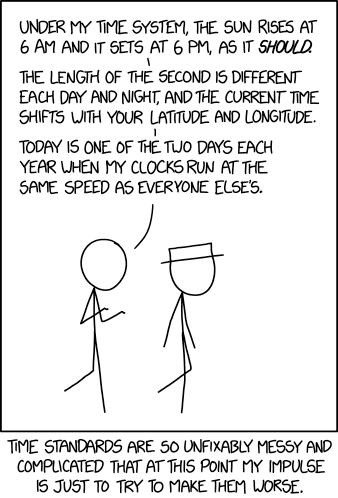 I read this comic and thought, "Isn't this how local time already works in parts of Arabia?" I still don't see why we can't just have a single universal time. Sure 00:00 might be the middle of the day some places and the middle of the night others, but what's it matter? It's just a number. If "lunchtime" is about 04:00 because that's when the sun is at it's zenith for the day, what's it matter that the clock says 4? Basically we'd be mapping the sun to the clock, rather than mapping the clock to the sun, and I think that would work much better on a global scale. pogrmman wrote: The Mediterranean coast of Africa is at a similar latitude to the Gulf Coast of the US (~30°N). That means there’s about a 4 hour difference between the longest and shortest days of the year. Seriously, though, I just looked it up. St Helier (Jersey, 49N) has the peak summer day of 16h14m (the remaining time being entirely twilight - civil, nautical and a full 4h15m of Astronomical Twilight) and a peak winter day of 8h12m (3h55m split evenly between the twilights, 11h53m of Night) giving a tad over 8h difference between the respective horizon-to-horizon Sun passages. Lerwick (on Mainland, not Unst, but still a tad over 60N) has a summer day of 18h56m (3h43 civil twilight, 1h21 nautical twilight and no astronomical twilight or night-proper) and a winter one of 5h49m (5h36 of the twilights, 12h36 of night - yes, I know that rounding errors mean that totals to 24h01m in total!) for a 13h-and-change difference between the two day-lengths. My idea to combine Daylight Savings Time with Leap Year: set the clocks back one hour every two months. Every four years that adds up to a day, so we can eliminate February 29th. You can count on me, I got your six. Soupspoon wrote: Seriously, though, I just looked it up. St Helier (Jersey, 49N) has the peak summer day of 16h14m (the remaining time being entirely twilight - civil, nautical and a full 4h15m of Astronomical Twilight) and a peak winter day of 8h12m (3h55m split evenly between the twilights, 11h53m of Night) giving a tad over 8h difference between the respective horizon-to-horizon Sun passages. That’s a lot of variation. Where I’m at — Austin, TX (30°N), it’s under 4 hours (I think 3:45 or so). I rounded it up because most of the Mediterranean coast of Africa is north of that — I think St. Augustine was in northern Algeria, which would put him at 35°N or so. Now that I think about it, the change should be more than 4 hours (probably closer to 5:30). This is crazy - 6 is far too early to get up. Make it 10.